The Samsung Galaxy Tab A Plus 8.0 with S Pen is an 8-inch Android tablet that features an active stylus. Sometimes it is called Samsung Galaxy Tab A Plus 2019. Well, it is called SM-P200 and SM-P205. Even though it is a budget-friendly device, it packs a lot of features. Among those are a full HD resolution, 3GB of RAM, an octa-core processor, optional LTE 4G, and Android 9.0 Pie. Here is everything you should know about the Samsung Galaxy Tab A Plus 8.0 including its specifications, prices, availability, and more. The new Samsung Galaxy Tab A Plus is an 8-inch tablet. From the front, it looks like a typical tablet from Samsung without a home-button or fingerprint scanner. It features a full plastic body that is 8.9mm thick and weighs 325g. You can get it in black and grey. The later one looks like a darker white – well, that’s what grey is. On the bottom, there is a USB C port, one single speaker, as well as a slot for the S Pen. We get a power button and volume controls on the right side. The left side features a microSD card slot. And, if you get the LTE version, that’s where the SIM card fits too. The microSD card can have a capacity of up to 512GB. On the top, there is a standard headphone jack. Because there is a speaker above the screen, you’ll be able to make phone calls with the cellular version. The front-facing camera next to it has a resolution of 5 megapixels. On the back, there is an 8-megapixel main camera. The Galaxy Tab A 8.0 2019 has an 8-inch screen with an aspect ratio of 16:10. It features a full HD resolution with 1920 x 1200 pixels. Even though it is a standard TFT panel, the viewing angles should be alright. It is powered by Samsung’s own Exynos octa-core processor which consists of 1.8GHz and 1.6GHz cores. Additionally, we get 3GB of RAM and a 32GB internal storage. Out of those, 21.9GB are free to use by the user. Its battery has a capacity of 4200mAh and is said to last up to 11 hours. 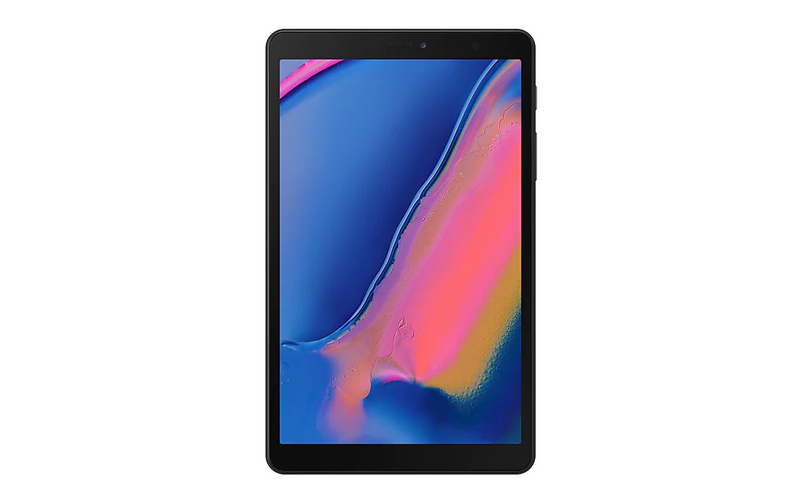 The Samsung Galaxy Tab A 8.0 with S Pen is one of the first tablets to directly ship with Android 9.0 Pie. A very important feature of the Samsung Galaxy Tab A Plus P200 and P205 is the S Pen. That is an active stylus and it is the same pen we are familiar with from their Galaxy Note smartphones. The S Pen is an active pen which, in this case, supports 2048 levels of pressure sensitivity. It has one button and does not need to be charged. The Galaxy Tab A Plus is one of very few tablets that can actually house their stylus. On the bottom, there is a slot for the S Pen so that you don’t lose it. Because of that, it is much thinner than the Apple Pencil or Microsoft Surface Pen though. Samsung is shipping it with a lot of pre-installed software made to use with the pen. Among these features screenshots that you can annotate, a drawing app, as well as an important notes app. Originally, the Samsung Galaxy Tab A Plus 8.0 with S Pen got announced by accident through Samsung Thailand on March 28th. It started to go on sale in Asia in April 2019. As of writing this, I don’t know the pricing yet. There are some interesting alternatives you could get instead of the Samsung Galaxy Tab A Plus 8.0. If you want a bit cheaper tablet, you could check out the older Samsung Galaxy Tab A 8.0 2017. While that ones does not support an S Pen and is a bit weaker, it is much cheaper. If you are looking for an 8-inch tablet with pen support that is more powerful, your only choice right now is the iPad Mini 2019 with the Apple Pencil. Yes, that combination is very pricey. However, the Apple A12 chip is much faster than the Samsung one. It also features a Touch ID fingerprint scanner and you can run professional software like Affinity Photo or LumaFusion. Another faster competitor running Android is the Huawei MediaPad M5 8. Even though it is a tablet from 2018, it is noticeably faster and has a much higher-resolution screen. It also features a full metal body, two good speakers, and 4GB of RAM. However, it does not support an active pen. The Samsung Galaxy Tab A Plus 8.0 with S Pen is an 8-inch middle-class tablet. It features a full HD screen, an octa-core processor, and Android 9.0 Pie. One of its highlights is the included S Pen which is an active stylus. If you want, you can get it with 4G LTE and phone support.